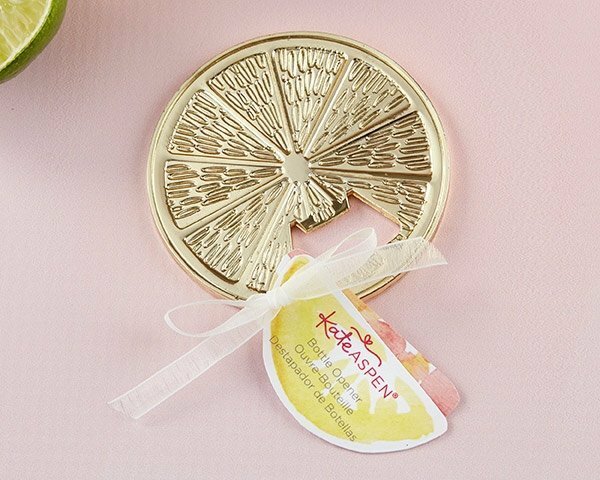 It's time to pop the top on the festivities, and what better way to do that than with Kate Aspen's Citrus Slice Bottle Opener? Bottle openers are a favor favorite, and these are especially refreshing thanks to citrus slice design on shining gold-toned metal. Gold bottle opener in the shape of a citrus slice with a bottle opening mechanism in the center. - Jean Lemmon, Naples Fl. 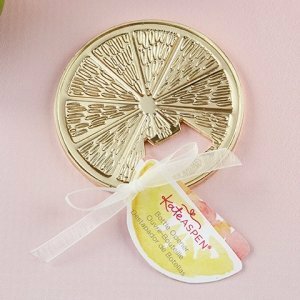 You'll see the personalization option after adding this Citrus Slice Bottle Opener in your shopping cart. I just had a question about the Optional Tag Personalization String. Is that the string itself or is that an added tag? If it is the tag- does that come as the same size as the one in the picture? The tag is completely separate from what is shown in the main image and the tag in the main image is always sent with the favor regardless if you choose the add-on tag. The "personalization string" is not an actual string; it's just a string of verbiage that has all your choices which are your options - design, color, text, etc. I hope that helps!